GOLDEN AUTUMN ASPEN at thomas creek..my annual PAINT there is one of the season's highlights for me...my PAINT starts here inspire me for the entire year...hope these add to your enjoyment of painting outdoors. my 2017 SOLO show at Reno's SVlibrary is now thru October 30, 2017... 14 of my contemporary oil paintings..watch my YOUTUBE video!! First Day of Fall and with it SNOW in the SIERRAS! !...Oh YES!!.. how I love the SNOW and walking in the Woods on a snowy afternoon...Emerson? 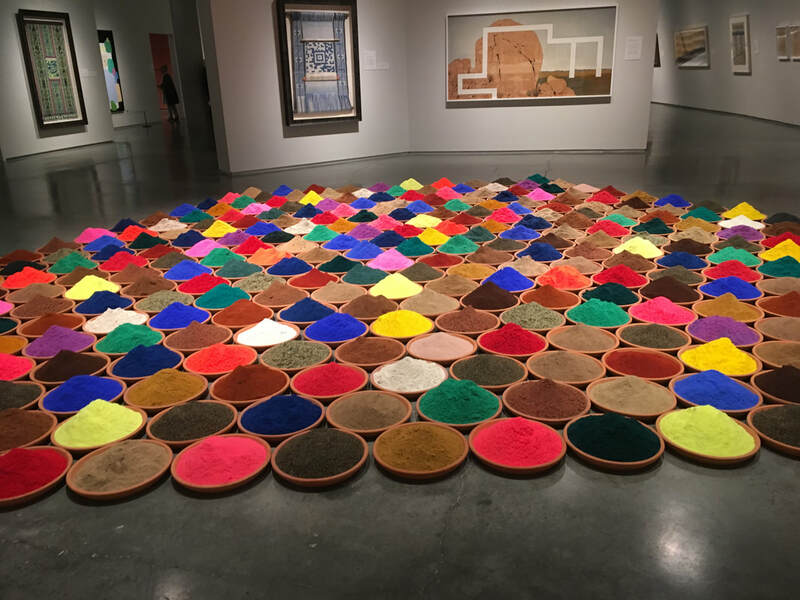 Photo here is from Reno's Nevada Museum of Art....CAMPO dE COLOR 2012 by Sonia Falcone... hundreds of herbs/spices! ..mesmerizing color!! UNSETTLED exhibit, thru Jan 21, 2018, explores the rich natural resources and peoples from around the world. FINALLY! 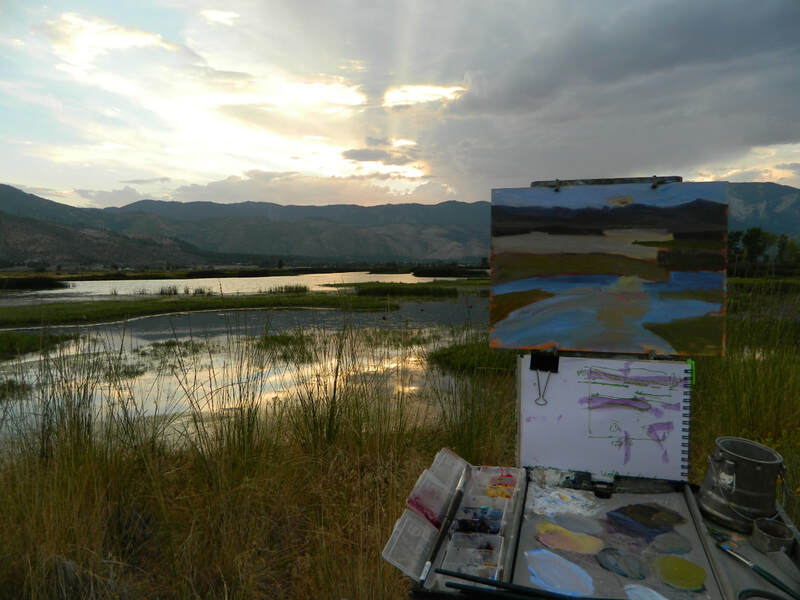 !..a nocturne PAINT @ the WASHoE WETLANDS..!! These wetlands provide a nesting for white pelicans, white-headed ibis, black-necked stilts, heron, American avocets and other migratory birds..and of course Nevada's own band of wild horses! I painted with artist friends Nan and Eileen..such a joy!! to share the outdoor experience. Golden hour gave us Blues, magentas,deep purpled shadows but you had to be FAST!! "GLOAMING at the WASHOE WETLANDS"... a 12x16" oil.. ...ahhhhhh...I am restored in beauty!! 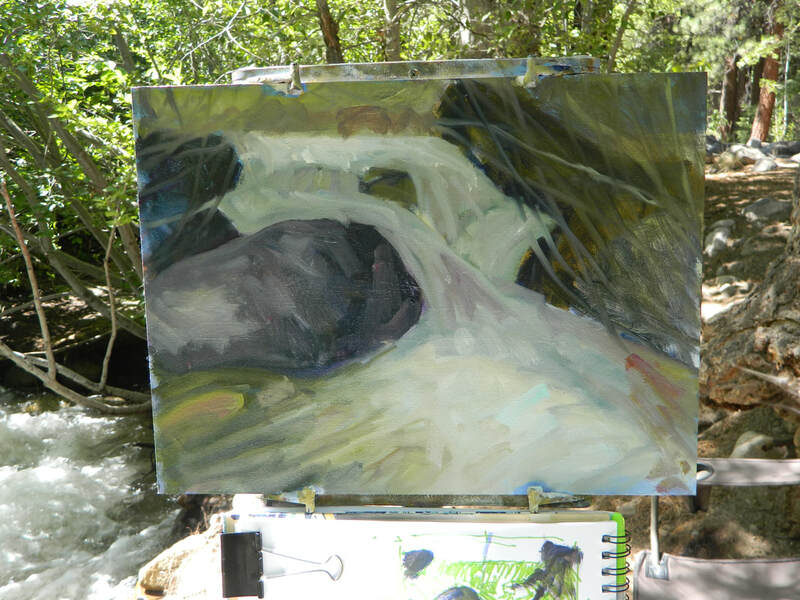 Another WATER Painting at the GALENA CREEK, in the foothills of the eastern Sierras at Mt. Rose. My annual PAINT @ Sonora Pass..the road didn't open until June this year because of the more than 40 feet of SNOW in the SIERRAS! PAINTING this Walker River slot canyon was a challenge but well worth it!! 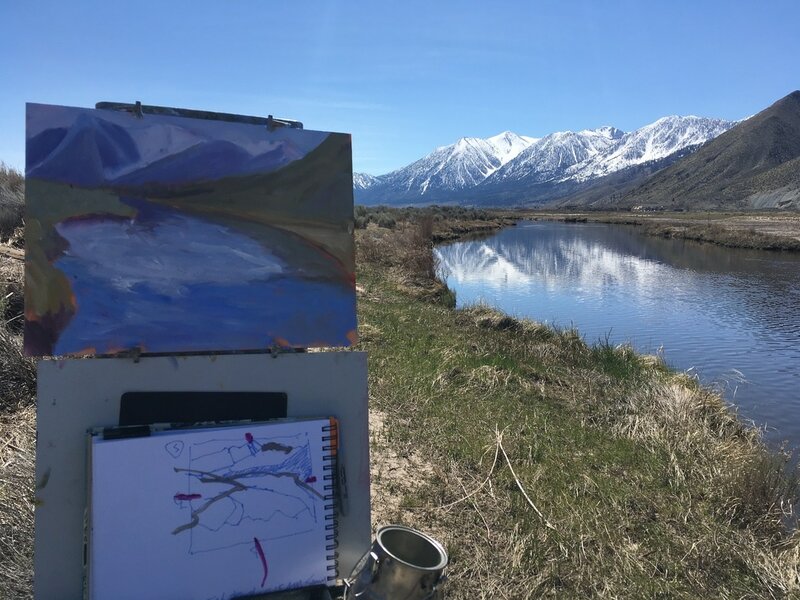 A pleinair PAINT at the River Fork Ranch, just outside of Genoa, NV..
.. several other paints including Sand Harbor, Rock Park and again at Idas. Each and every week I am inspired to PAINT the BEAUTY of NATURE ! ... and very grateful to have this opportunity. Joining me are two of my Painting buddies. This is a HUGE SNOW year for the EASTERN SIERRAs and we are ALL feeling very excited about the possibilities! 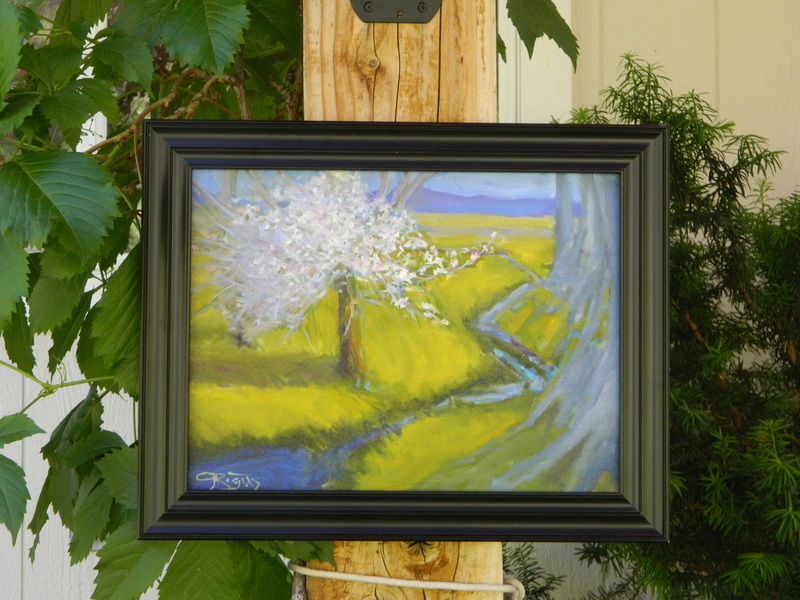 APPLE BLOSSOM SPRING at IDAs....my finished painting is now at the METRO GALLERY, RENO...IN THE OPEN 4 exhibit and sale... 15 artists from the RENO TAHOE PLEINAIR PAINTERS. June 13-July 29, 2016. Artists reception on Thursday, July 7th..5-7p.m. 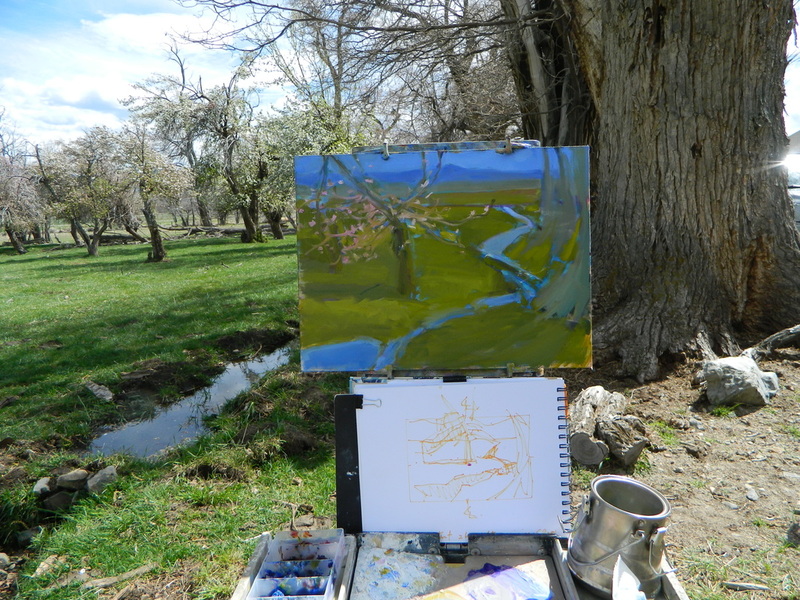 SPRING 'pleinair' paint at Idas Orchard...in honor of ARBOR DAY on April 29th!. Her apple orchard was in full bloom giving me not only a visual delight but a scented surprise!.......celebrate SPRing and it's exciting possibilities! Jan 2nd thru February 27th...Had a wonderful turnout of friends, family and collectors! !...sold two paintings! Yes! 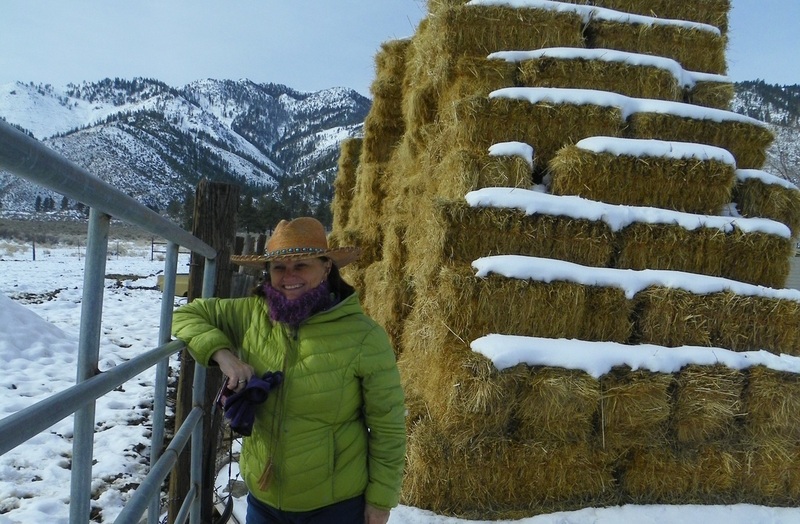 Yeh, that's me at Ida's Ranch in Fredricksburg,CA ...getting ready to PAINT the cattle which are somewhere out of the photo...! Job's Peak in the background! A stunningly clear windless day to enjoy and paint.! ​a January PAINT at Scripps bird sanctuary in Washoe Valley...seems to be one of my favorite go-to places..surface ice gives a sparkle to the surrounding wetlands...sublime abstract patterns emerge from the canvas!..it's magic! FALL 2015. A 12x12" oil painting done "en pleinair"!..again at the Brunn family homestead..Fall has finally arrived in the Carson Valley this year..fields have turned to ochre and yet some remain green for one more Autumn cutting! I've managed to paint 6 layers from this vantage point. !....more paintings to come from this historic ranch. IDA'S ORCHARD 12x12" oil painting. FALL 2015......This oil painting is now at the South Valley's Library show and sale till November 21st along with 10 other artists from the RENO TAHOE PLEINAIR PAINTERS. The Brunn family homestead in Fredricksburg, CA is a wonder to paint!!! The abandoned fruit trees have this exquisite life to them! !..or is it me? ?......another great painting day!! SPRING and SUMMER at the Tahoe Meadows 2015. To the left is my inspiration for SHOOTING STAR SPRING, an oil painting (below). The Tahoe Meadows has been my muse for so many years! I have a close relationship with the topography there...BTW, these shootings stars are the first wildflowers you'll see in the meadows....! A spring gift for all to enjoy. ..Summer there now with 5 ft. corn lillies, the ubiquitous pennyroyal and much more! I could paint just the wildflowers and never exhaust the painting possibilities! SHOOTING STAR SPRING 12x12" oil. an original contemporary oil painting now exhibited at the South Valleys Library in Reno, NV. thru to November 21st. 2015. ​.......now in my SOLO show at the Norhtwest Library! thru February 27th. February 2015 PAINT @ the WETLANDS......gloaming at the WETLANDS!! Sunset paints are always a challenge....such great light and so little time!! ...be prepared to paint fast! !...as always, I have my thumbnail ready long before the gloaming... gets dark soon after the sun is finished.! SAND HARBOR January2015 PAINT......a 12x9" pleinair oil painting. Weather perfect for my annual 'pleinair' at Sand Harbor, Lake Tahoe, NV. with painting buddy Karen M... Lake Tahoe is probably 7ft. lower than usual!. CAROL at 9800'...... fall hike on the PCT at SONORA PASS. "Keep close to Nature's heart...and break clear away, once in a while, and climb a mountain or spend a week in the woods.. Wash your spirit clean." I'm a better painter than hiker......! !...we lasted two hours!! Luckily it started to rain and so we headed down the mountain!.....thankfully for me! ahhhhh...John Muir, either way,you've inspired me!! An annual January PAINT @ CARSON PASS...elevation 8500'. Painting the western Juniper at Carson Pass has always fascinated me. This day was sunny and the perfect opportunity to PAINT the most picturesque tree of the HIGH SIERRAS! John Muir called the western juniper: " a thickset, sturdy, picturesque highlander, seemingly content to live for more than a score of centuries on sunshine and snow...". The spiral grain found in the growth of most western conifers is what first attracted me to this giant...and keeps me coming back to it..To the left is my painting start...! Painting outdoors is always a challenge, but when this artist forgot her umbrella and painted in 'dappled' light, it was a major problem....hard to see both the canvas and my palette.! And yet the dynamic composition of the kokanee salmonrun visible thru the clear cold headwaters of this Lake Tahoe feeder stream, Taylor Creek, was well worth the effort.!!! With many reference photos, I was able to finish this 12"x16" oil painting back in the studio! SPRING 2014.. in Lamoille Canyon.. .again??!!! ​A WINTER SOJOURN to THE MEADOWS 2014. 12x12" original oil on c.b. This PLEINAIR painting ..pictured on left..is from the Tahoe Meadows and will be featured at the Nevada Land Trust's annual BANFF FILM FESTIVAL & Silent Auction...April 3, 2014 @ 5.30p.m. www.nevadalandtrust.org for more details. This painting was inspired by the many snowshoe/hikes/ walks I've taken to "sheep flats". For more than 25 years, I've explored this little piece of "mountain delight" and never tire of it's seasonal wonders. Anyone who has ever walked in the woods, especially in WINTER, has felt it's dignity, beauty and monumentality. The Nevada Land Trust, as well as the Friends of Mt. Rose, has protected this land as one of Nevada's OPEN SPACES and SPECIAL PLACES. 1. IDENTIFY your intentions....what's your FOCUS?? 2. Create.....do several thumbnails quickly! and then "just do it".....paint.! 3. ANALYZE your results!! I was very satisfied with my results and love the abstract nature of NATURE! Annual January 2014 Paint at SAND HARBOR. My block-in ..aka underpainting... with thumbnail below. Water level is extremely low exposing a new variety of subject matter...even more ROCKS!! Always looking for pattern and design, I find it in the monumentality of these structures. Large against small can create wonderful designs when the artist knows HOW to see!! I used magenta for my toned canvas! !...a daring color no doubt but it will give a sparkle to my finished painting! ....ahhh... the sylvan environment feeds my artistic soul! 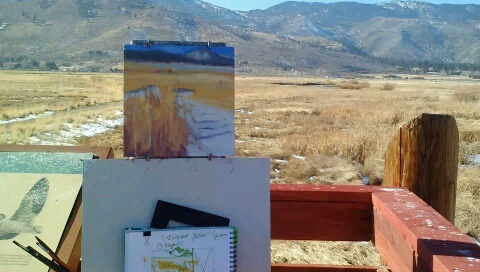 PLEINAIR PAINT at the Washoe Wetlands. New Year's Day 2014! A cold CRISP January PAINT at the Washoe Lake Wetlands... I never seem to tire of revisitng this area, especially in the WINTER! An IBM...important bird migration area... these wetlands teem with activity in late February. January sees the area with little water and NO birds, only a quiet refuge for 'pleinair painters'. Hundreds of acres of rushes, cattails, and other flora fill these wetlands! Surrounded by mountains to the east and west, it's a painters dream! My block-in has exciting compositional possibilities! SKY TAVERN SKI PLEINAIR PAINT. It was a cold clear morning PAINT at Sky Tavern Ski, a local ski resort in the Mt. Rose Wilderness of the Sierras. 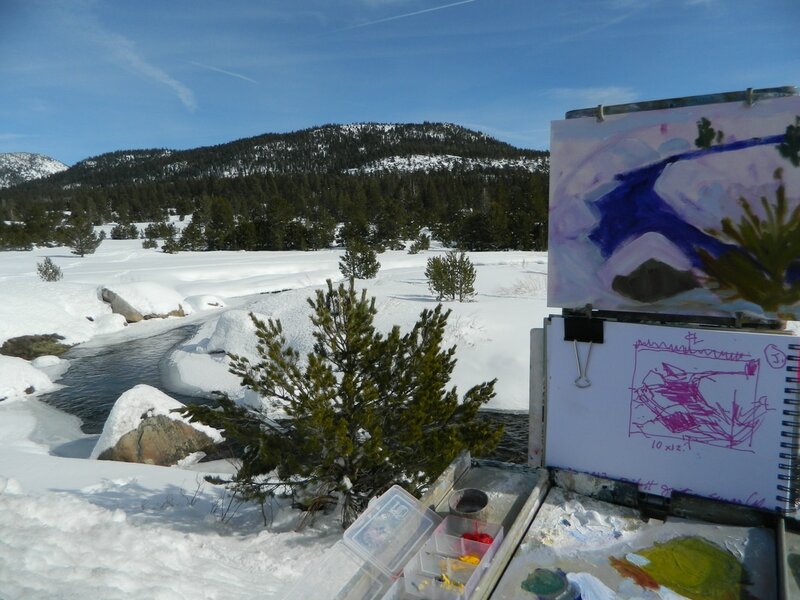 Four of us intrepid artists, the RENO TAHOE PLEIN-AIR PAINTERS, were out in the COLD CLEAR air of a Nevada Winter, excited by the challenge of WINTER painting at 7,500'+ ! In the painting to the left, I chased the shadows for about about 20 minutes until I found the composition that worked. Of course I did several thumbnails....and always have them close for easy reference... no need to get too detailed with these notans.... It's more about the design possibilities than a finished t.n.! Look for the finished painting soon on my PAINTINGs page!! Fellow artists and friends, Emma and Carolyn, paint a few yards from an enormous Aspen stand now turned green/grey in the WINTER light.......ahhhhhhh......"shinrin-yoku! !..forest bathing!! 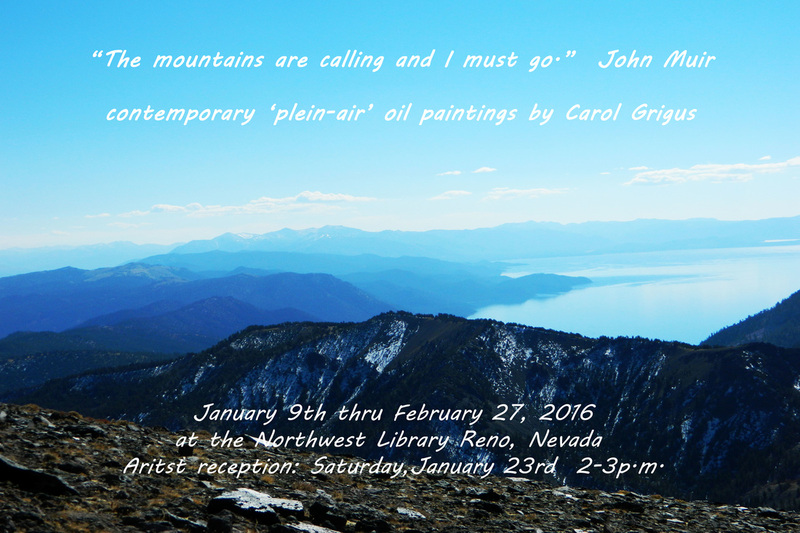 The Reno Tahoe Plein Air Painters is an intrepid group of artists who weekly PAINT OUTDOORs together. Several different mediums are represented and we do have monthly 'critiques', not only to evaluate new work, old work, but also and more importantly, to network with each other. I am very grateful to live here in this sylvan paradise and be a part of such a dynamic artists' group. "Nothing Plein about this Air". In November the NEVADA LAND TRUST painting group.. www.nevadlandtrust.org....scheduled a PAINT day on the Carson River at Brunswick Canyon. This area was known for its many stamp mills during the heighdays? of the Comstock Lode. Photo on the left is my block-in of the rock formations across the river. The NV Land Trust is one of my favorite non-profit grassroots organizations dedicated to preserving and protecting sensitive Nevada lands. They have partnered with landowners, businesses and other environmental organizations with the goal of preserving special Nevada places for future generations. AUTUMN GOLD!!! OCTOBER 2013.. in the eastern Sierra Nevada. 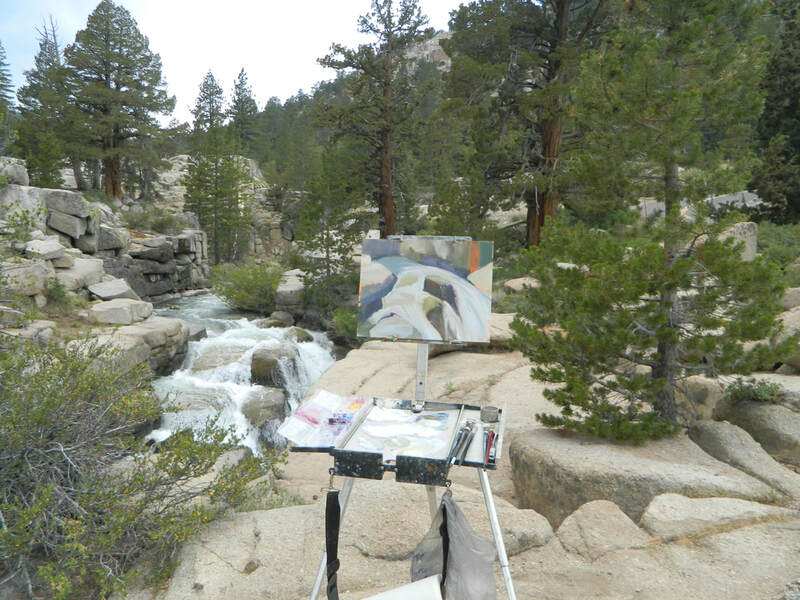 One of my favorite spots to paint, the ASPEN truly inspire and renew my spirit! Autumn, one of the most brilliant seasons, presents challenges in GOLDEN, crimson patterns. patterns in nature. Photo on left is my plein-air start on Conway Summit.. elevation 8140 ft.
Can you see the serpentine pattern of the aspen?....another sylvan moment! BEAVER DAM in Lamoille Canyon, Nevada. The mesmerizing structural pattern of this enormous beaver dam is intricate and texturally challenging. I start with several thumbnails of the area....to find my 'focus', my ahha moment! Note my sketchbook is below my canvas for easy reference. I've visited this area every AUTUMN for the last 13 years and never tire of it. A new discovery on every trip! Nature reveals her 'secrets' slowly! ... be patient! The many oxbows of the Walker river make wonderful serpentine patterns on the landscape! NATURE and beauty, they've inspired me since before I can remember! Running in the woods behind my midwestern babuska's Indiana farm, I can't remember ever feeling more alive than when I was outdoors! Pleinair painting has been a wonderful gift, combining my love of the outdoors with my passion for painting! I am truly blessed and extremely grateful. 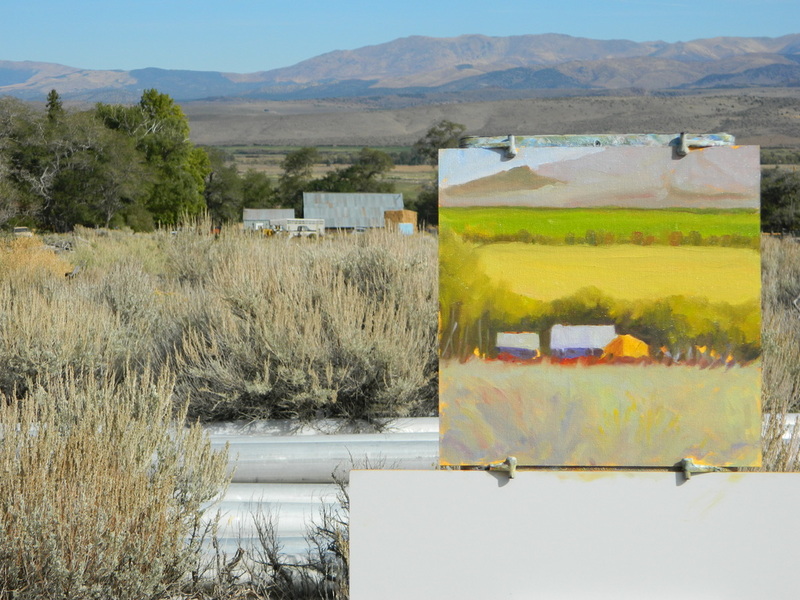 A quiet place to paint with sweeping views of the Comstock Lode. These ironwork gates are ubiquitous to this location; even found them in a Tuscarora cemetery. Built to last, they are an artist's dream to paint.! You can see the finished piece in the "paintings" section of my website.